Vertical Challenge offers a quality Window Cleaning service to our both our Commercial and Residential clients. 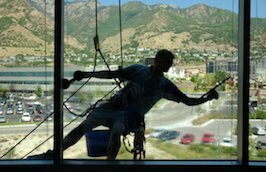 We are a professional cleaning company with over 35 years experience providing commercial window cleaning services. Window Cleaning, Height Work and Industrial Work throughout the Greater Sydney Region - by Rope Access, Boom Lift, Scaffolding or Building Maintenance Unit . Vertical Challenge is a specialist height access company servicing the requirements of our customers for building facade cleaning and maintenance. Our particular speciality is in the solving of difficult, or dangerous, height access problems, both In and Outdoors. We manage sites requiring a team of cleaners or just one individual. No matter how frequently you need your windows cleaned we always deliver the highest standard of workmanship, ensuring quality results. 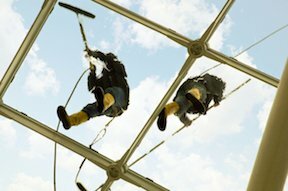 We hold broad experience in the full range of Window Cleaning and Height related Access Methods. We presently enjoy the support of over 100 regular commercial clients providing specialist height services to Sydney Airport, QANTAS, Westfield, Transfield, Serko Sodexho and Honeywell. 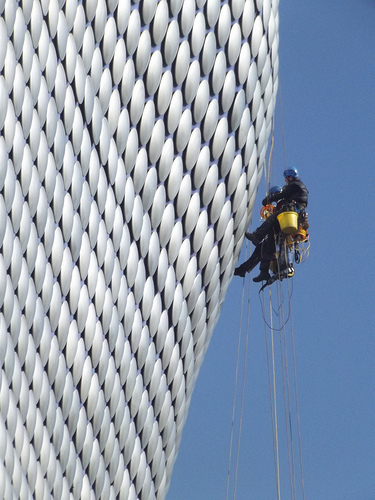 We also employ highly experience Rope Access Technicians (Abseilers) for Building Inspection work, General Maintenance, Minor Repairs, or High Level Cleaning. With over 30 years experience in solving the problems of difficult, potentially dangerous height access - many complex and almost impossible projects. We guarantee a high level of professionalism, efficiency and quality of work. Vertical Challenge has the right solution for you! Offering all kinds of window cleaning and height access solutions to building managers, owners, realtors, contractors and householders. Vertical Challenge Pty Ltd have been cleaning Warehouses and Factories since 1982. Our expertise is focused on height cleaning or challenging work involving difficult access solutions. Meeting the rigorous cleaning standards for Accreditation and Audit; whether it be a massive QANTAS Spare Parts Warehouse (the size of a football field), a Westfield’s Foodcourt, an Army Base Kitchen or working Airside at a busy congested Airport. Our clients without fail have always passed audit - this is our guarantee to you, our valued client. We detail clean buildings from ceiling to floor – ceilings, walls, window, floors, fans, joists, beams, pipes ducts, pallet racking (and stock). Washing, vacuuming or scrubbing all surfaces, removing dust, dirt, grease, grime, inks, mildew, mould, paint, marker pens and other filth. Externally we clean roofs, skylights, canopies, cladding, fascia, gutters, and pipework, drains, signage, paving and carpark areas. Full building wash downs our specialty. Façade Cleaning with associated features of stone, brick, concrete, render, paint, metal, colourbond, plastic and wood. Vertical Challenge excels in all aspect of height work that comes with a unique problem solving challenge, or high degree of difficulty. We are experts in the area of difficult height access, employing scaffolding, elevated work platforms and rope access solutions. The result of our thorough cleaning of your building will be a brighter, safer, healthier and better working environment. For Best Possible Rates and prompt same day response text a few images. We have been privileged to clean many Quality Private Homes and Estates these past 14 years. Our always friendly and polite cleaners exercise the highest standards and will display the greatest respect for both your privacy and home. Fastidious care is be taken in protecting the interior of your home. All employees have been with us for many years and are honest and of proven good character. Our many satisfied customers will attest to our overall good performance and dedication to quality of workmanship.